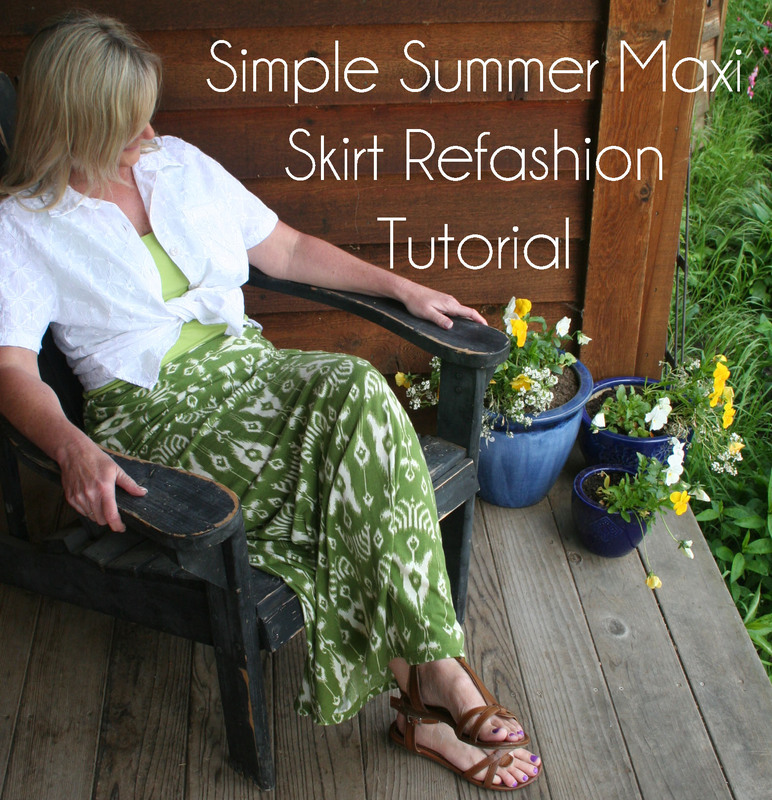 This entry was posted in Crafting, DIY, fabric, Photography, Reconstructed clothing, recycling, Refashioning, Sewing, Thrifting, Tutorial, Upcycled clothes, upcycling and tagged DIY maxi skirt, skirt refashion. Bookmark the permalink. I’m completley fascinated and mesmerized by your sewing tutorials – even though I can damage a shirt just sewing on a button! This one is just like all the others………fantastic! You are so sweet Kelli, however I am fairly non conventional in my sewing techniques. There’s no couture in this girl I’m afraid. 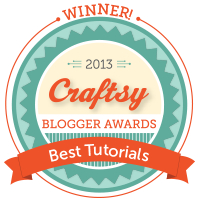 Just found your blog today, and you are so very talented! WOW! 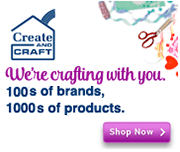 One question, do you refashion using your serger if the material is knit? I don’t have a serger in my sewing room yet, so I just use a double needle or a zig zag stitch. I love this. Now only if I had your sewing skills. My poor (brand new) sewing machine barely gets any use :(. Thanks for the inspiration! If it makes you feel any better, Kelly, my sewing skills are pretty basic. That’s one reason I love to refashion because most of the time, half the work is done already. 🙂 If you ever try it, I’d love to see your work! Thanks Beth! I have sewn a few basic things and they come out ok. I think I need to take the time to learn about my machine and how it works a bit more. Then I may be more daring in trying things. I am going to try to sew some training pants for my daughter in the next couple weeks. Keeping my fingers crossed! Thanks for the great tutorials. You are so welcome Kelly. I have so much fun sewing and sharing the things I make. I hope you’ll share pictures of your project. I’d love to see them. I pinned this. You do such a good job! Thanks for the pin and the encouragement! I have loads of fun doing this but it wouldn’t be half as fun without people like you. I finally got around to making my site button. Thanks for your help! I’ve added you to my sidebar, too. 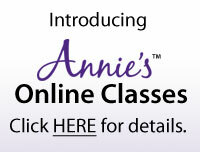 Oh, I’ll have to check it out and add your button to my sidebar. Thanks for letting me know and adding me! I tried to put your widget in my sidebar and it wasn’t working. Hmmmmm…. That’s strange. I tried it on my own blog and it worked. I will look into it and see if I can figure it out. You are going to need a whole new closet! I need a sewing machine-any out there somebody is not using? I’m gonna have to move into Cooper’s closet. He won’t mind, he doesn’t need much space. 🙂 Too bad you got rid of your sewing machine. I’d love to see what you would make! So cute! That fabric is great! Thanks Nettie! The fabric was the ONLY thing that made me put THAT dress in my bag. That is so adorable! I love the outfit! Keep up the good work! You are so nice! Thanks for the encouragement! 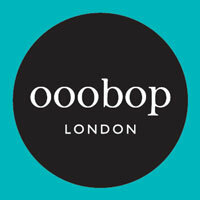 You have a great eye for colour and fashion. Love the green fabric and how you pair it with a green T-shirt and contrast it with a crisp white blouse. Thanks so much. I’ve only recently realized that green is a good color for me. Now I can’t get enough of it. Oh yeah! What a beautiful transformation! Thank you for all of your sweet comments! They really mean a lot to me! You are so sweet! Thanks for your kind words!!!! I love it ! So glad you are sewing this weekend. I am wrapping soap for market… my socks are rolling up and down:) also started painting my office….. Thanks Marty! Yes, I had to do something to “make my socks roll up and down” this weekend. 🙂 (A Steveism at it’s finest) Don’t work too hard and I might see you at school sometime this weekend. 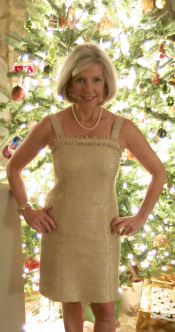 Oh so much better – I am so glad you took that poor dress out of it’s misery and made it into something so stinken’ cute! Excellent as usual! “Take that poor dress out of it’s misery”, so funny and true. Thanks for all of your encouraging words. They really mean a lot! 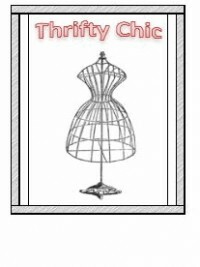 Super skirt, your ideas are totally inspiring, I’m going to get the machine out today! Thanks Angela! When I see something I like, I always think, “I could just make that”. Then the idea takes over my brain until I’ve at least tried to make it. Sometimes, I’m not sure if this is a blessing or a curse. 🙂 Have a great day and I hope you get to sew! Bravo Beth!! This one & the tshirt are now my two favorites. You have a really great nack for doing this. Great job. Thanks Laurel! 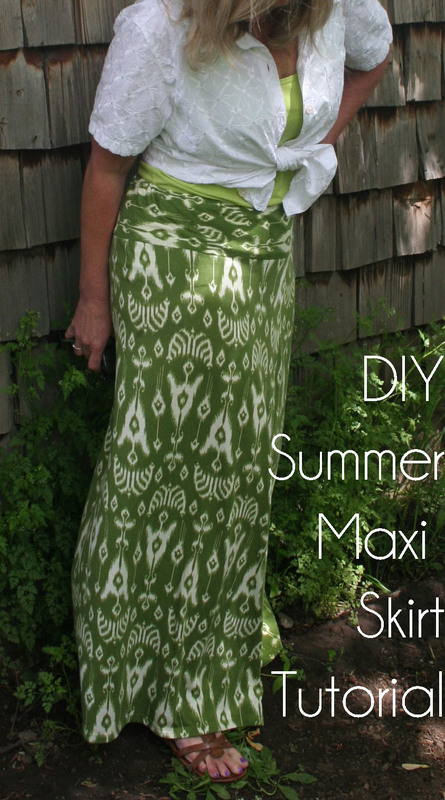 I think I may be making a few more of these maxi skirts this summer. Thanks Janene! You know I really didn’t wear much green until I started blogging and realized it is a good color for me. Now I just can’t get enough of it! Definite upgrade! You’ve taken a saggy thing and given it classic styling and flow. Lovely. Thank you! Wasn’t that saggy area hideous! I can’t believe someone even bought that dress “as is” in the first place. Perhaps the color lured them in as it did me. I was taught the old school method of sewing, with a paper pattern. I am utterly in awe of how you bravely take off and just start cutting. You make beautiful things from things I would throw away! Keep posting your patterns. I am learning so much. Thanks for all your kind words! They really mean a lot! I so enjoy seeing your clothing upgrades and am attracted to the same sort of colors and patterns that you’ve been choosing for your projects. 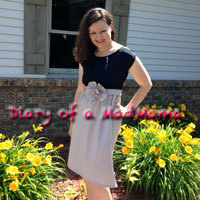 I would be really interested in seeing what you would do to create a top from a dress that is similar to the one in today’s maxi-skirt project. I am constantly finding “interesting yokes and bodices,” but need some inspiration to repurpose them into a wearable top or dress. Any plans for that sort of project? That is lovely! Far more attractive than the saggy dress! I think I will have to find something similar at my Sally Ann to redo. Oh, I hope you can find something fun! And don’t forget to post pictures!!! I’d love to see what you make. LOVE this! You look awesome. Thank YOU so much!!! Please post pictures when you finish the skirt. I’d love to see what you make! Great job. And thanks for doing a tutorial. I’m going to do this when I find the right thrift store dress. So many ugly thrift store dresses, so little time……. 🙂 Please let me know how it turns out! I’d love to see…..
Love this! You are so inspirational!! You are sweet to say that! You know, if you proclaimed to not only have delivered yourself, but cut your own umbilical cord, I don’t think I would be all that surprised. You’re the epitome of efficient and competent! I so enjoy coming by your page, sifting through your tutorials, whilst knowing I will not likely EVER attempt to master one of these DIY’s myself. LOL. You are gifted, my friend. Thinking lots about you this weekend. You are too funny! If I can do this….ANYONE can! Believe me. Awesome as usual! You’re a restyler after my own heart! Thanks for sharing. 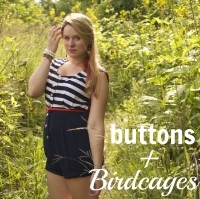 I love love love refashioning! Beautiful work! I’ve never refashioned anything (since I don’t know the first thing about sewing), but your skirt sure makes me want to try. I really like this. You have so many good ideas. Hmmmm I wonder if i could do that with a dress I have? I absolutely love this. Read part of it a few days ago; but didn’t have a chance to respond. I love maxi’s. Thanks so much Sandra! I think maxi skirts are going to be my staple this summer. I’m having a love affair with them too! Niiiice! And it’s jersey as well, I couldn’t tell when I saw the first couple of pics in Reader.. Thank you! And BTW, thanks for posting about the RSS feeds the other day. As soon as school is out, I’m going to learn all I can about that and I’m starting with your post. Happy that people are getting some use out of it! Oh I hope you get a chance to do this. Sooooo comfy and easy! I like the skirt much better after. Cute summer color. Great job! I also love how you write the text on the picture. Are you putting these ideas on pinterest? If not that would be a great way to promote your blog. Thanks for all of your encouragement!!!! Many of my projects have been pinned on pinterest. So far this skirt has actually been pinned and repinned over 500 times. I get so excited and amazed when people like my stuff. Darling idea! Love the potential you saw in the bargain find. Thank you so much. I love your drawings with the quotes on them! That was an awesome dress to make into a maxi!! I need to find one of those and make a couple of maxi skirts as I have none so far! Thanks for the great tutorial too! Are you going to refashion the beaded neckline into a statement necklace? You are so welcome! I thought about making that into a necklace, but it’s in pretty rough shape. Who knows though, it might just speak to me one of these days. Ugh! 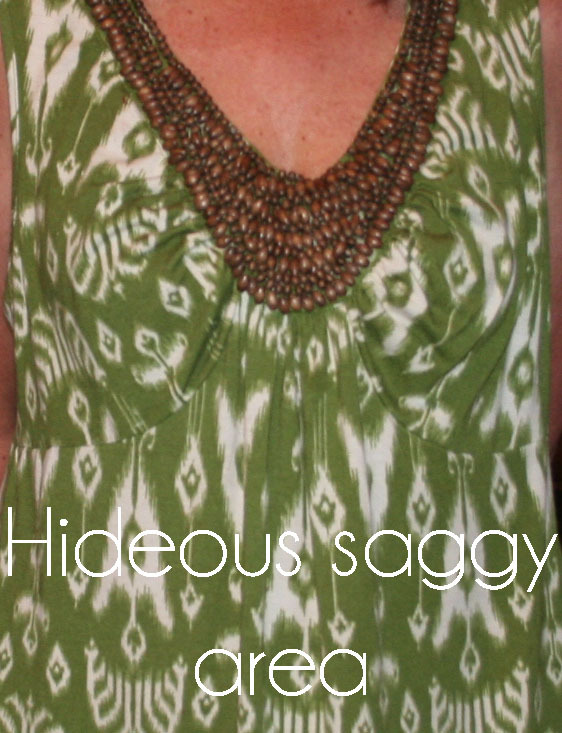 I have a dress that has a similar “hideous saggy area” as well. Why in the world would they purposefully make something look like that? Least flattering bust EVER. I think I may need to turn mine into a skirt as well, great idea! Oh, I hope you do it! I’d love love love to see how it turns out! Off to the thrift/charity shops tomorrow!! Good luck! Here’s to finding something great. Let me know how it goes!!! What a great idea! I love the results. Thanks so much. A quick and easy skirt! Love your refashions! I want to be your neighbor so I could pick your brain daily! 😉 I am a big girl and hate all the big girl fashions. 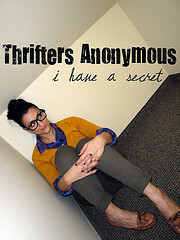 I also love thrifting and have so many ideas for ‘refashioning’ but can not figure out how to do them. I pinned your bleach pen tee. FUN! 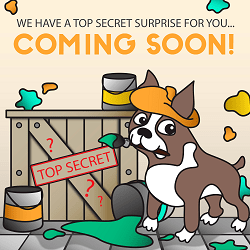 Can’t wait to see what you come up with next! Wow, I love that skirt! This makes me want to go to the thrift store and find an ugly dress to turn into something awesome! Oh, I hope you do, Lily! Let me know how it goes, I’d love to see what you make! Love your creativity! Had a questions about the ruffle on the cardigan. Just by increasing the tension and lengthening the stitch this will make it ruffle???? I’ve always wanted to buy a ruffler foot, but will have to give this a try. 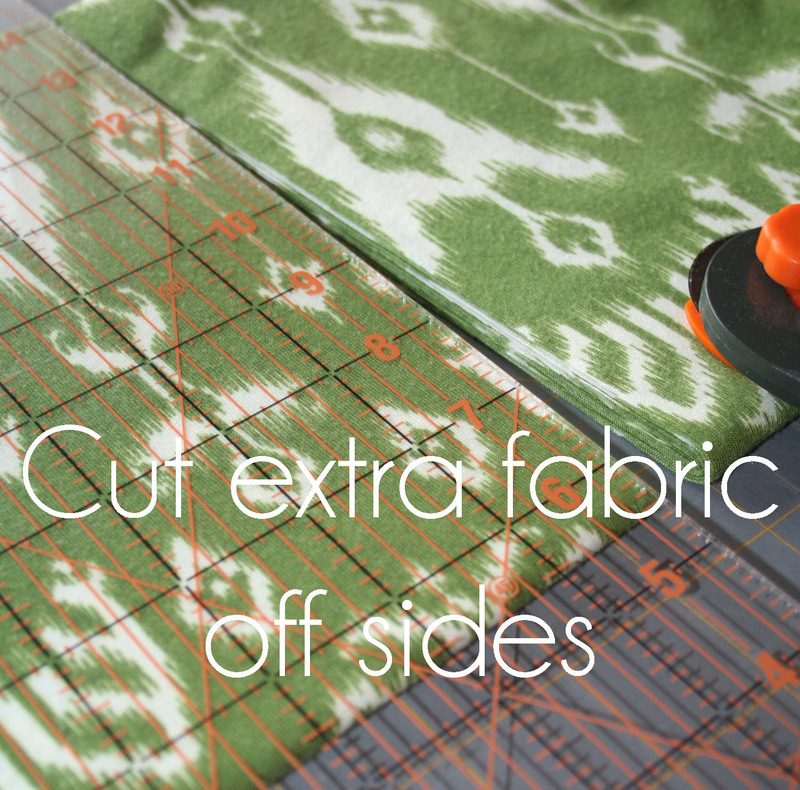 Yep, works if you’re using a knit fabric. I’ve been getting thrifted dresses and having my friend shorten them for me. Many times they are fifty cents, like you say! SO incredibly fun and rewarding. Thanks, Phyllis! It’s so fun to find things at the thrift stores and make them into something new. 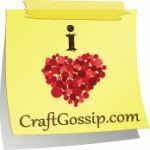 I hope you find some good treasures for your seamstress to refashion! You are so welcome! 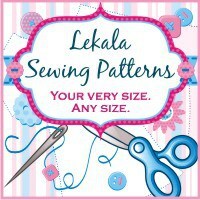 Have fun sewing and I’d love to see pictures! Your tutorials have inspired me to get my sew on… lol. You make it look so easy and most of all like all I need is a dose of common sense. Check…got that. I noticed your double straigt stitch on one of the hems. What kind of machines do you use? 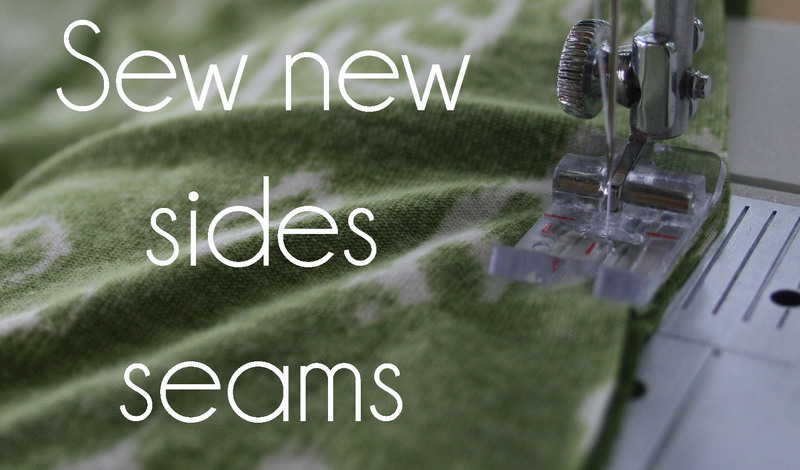 Serger, Coverhem machine or just a plain old sewing machine? If you have a post on all of this just point away. Thanks for the inspirationan and sharing!!! I just use a basic Singer sewing machine for everything I do. Sometimes I use a double needle. I don’t have any posts on that, but I think there are many tutorials out there. Happy sewing!!!! Hello Beth, I love your remakes. I’m so glad I found you. Awesome”.? I want to add ruffled lace to a half slip so that when I wear it you see it. Have you done anything like this. I haven’t done this, but it’s a great idea!!!! Good luck, let me know how it works out for you! I love that first photo of you…you’re beautiful! The skirt is really pretty too. So well done. Love the easy to see photos! Nice use of a really ugly dress. It is probably thanking you now! You are right though, cute pattern! Thanks! 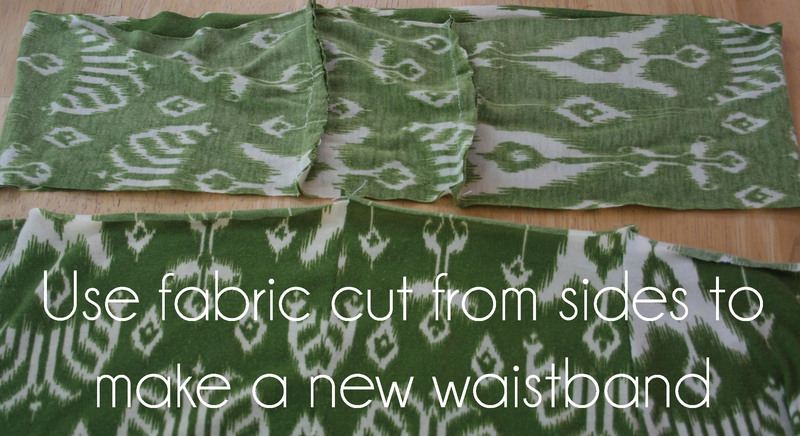 I love this ikat fabric, too! whoa, that saggy area was hideous! so cute now, love the fabric. any plans for the beaded section? I may have to try this! I picked up this peacock feather print dress at Goodwill, but it’s hideous as a dress! I was thinking throw pillows but this looks like more fun! Oh, I bet the peacock feather fabric is great! I’d love to see it when you finish. 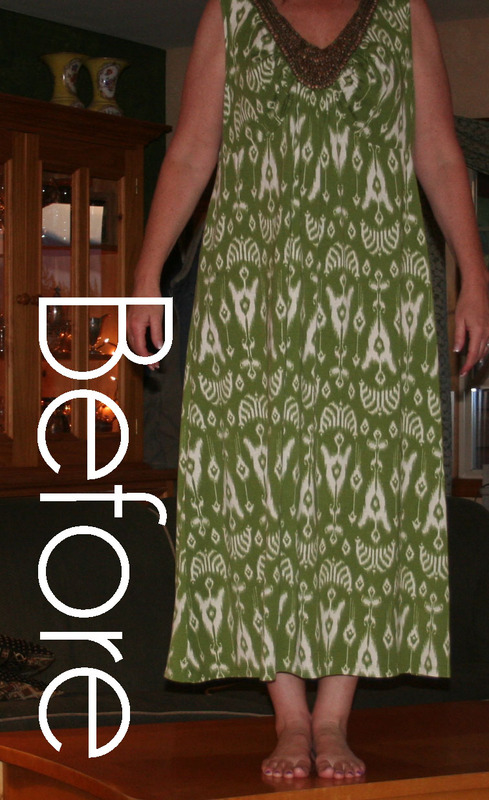 Pingback: Refashion: Thrifted Dress to Summer Maxi Skirt! Oh yeah, baby. 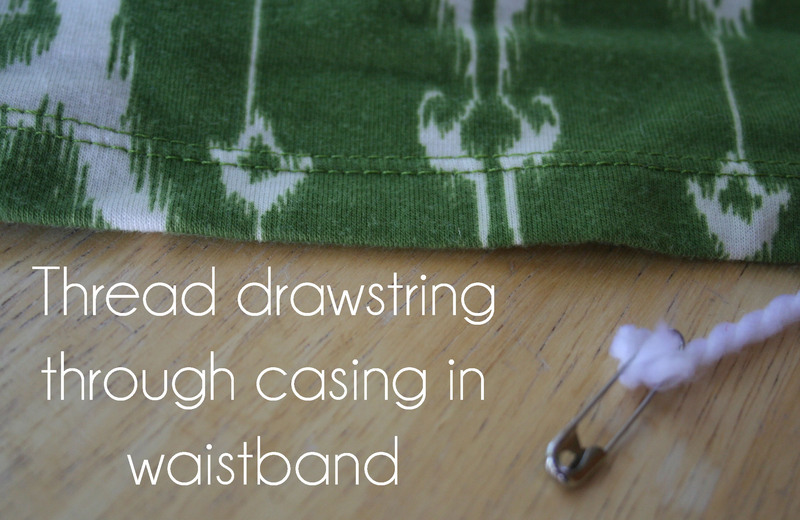 Sewing is always all about the FIT and the refashioned skirt hugged you like a glove! Great job turning the baggy sack into a stylin skirt. Thank you, Judy! You’re right, fit makes all the difference in the world. Have a wonderful day! Thank you, Shelley! 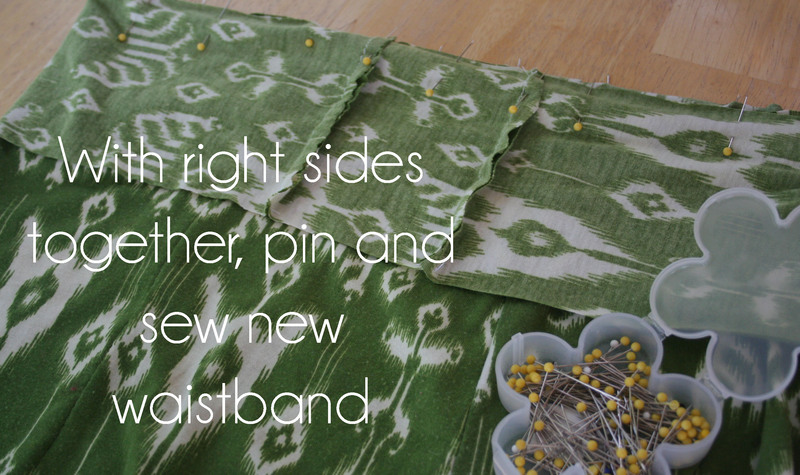 Welcome to The Renegade Seamstress!